Who isn’t hiding a secret? That’s what Private Investigator Jade O’Reilly wonders as she looks into the theft of an artifact destined for the local art museum. The artifact’s owner is a man so wealthy he could buy the county and who wouldn’t mind also investing time into Jade. His advances don’t please Keith, Jade’s romantic interest. But that’s not the only source of conflict in the developing relationship. Why doesn’t Keith want Jade applying to carry a concealed handgun? Will Keith convince Jade to scrap her application, or will Keith’s mind change as Jade’s investigation takes a deadly twist? Hidden Betrayal is the second novel in the Jade O’Reilly Mystery series. What begins as a white-collar crime investigation soon becomes deadly complicated with private investigator Jade O’Reilly on the scene. Trouble arises when Benton Rowe, one of coastal North Carolina’s most successful businessmen and eligible bachelors, finds a local store selling embezzled merchandise from one of his shipping companies. Benton bypasses the police to find the embezzler his own way. 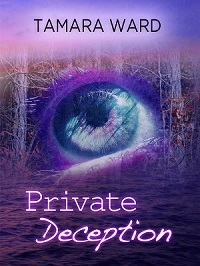 He hires Jade to work undercover from inside his company to solve the crime. Jade sees the case as the ideal cover to dig into Benton’s possible involvement in her father’s death. As Jade is swept into Benton’s world of penthouse apartments and fancy yachts, her boyfriend, Keith, isn’t as thrilled with Jade’s assignment. Nor are the thuggish members of Benton’s security team, one of whom appears as suspicious of Jade as she is of him. Will Jade get to the bottom of the embezzlement at Benton’s shipping industry and find dirt on Benton before she’s permanently exported? 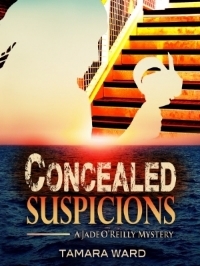 Concealed Suspicions is the third novel in the Jade O’Reilly Mystery series. When a priceless vase disappears during the fanciest party of the year in the fictional town of Sweetwater, NC, it's up to private investigator Jade O'Reilly to recover the family heirloom. As Jade tracks down the vase, she juggles pressures from her ex-fiance, Dale Pickles, and hard-core co-worker Mack Blackmon. This Sweetwater Short story is about 40 pages in length and originally was published in the WG2E All-For-Indies Winter Wonderland Anthology. If luck is a lady, she's certainly not private investigator Jade O'Reilly. 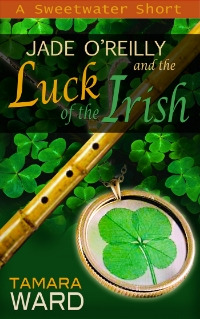 When Jade is late to work, she's punished by being assigned what may be an unsolvable case: find a missing four-leaf-clover good-luck charm before the town's St. Patrick's Day Festival. With an Irish cooking competition deadline bearing down, Jade chases clover clues while searching for the owner of a troublesome black cat that visits Jade's apartment to torture her on a nightly basis. Jade also is determined to pinpoint where her brother is spending his mornings and evenings—because it's not at his house with his wife and son who claims that "Daddy's got a secret." It's lucky uncovering secrets is Jade's specialty, even if luck itself is not. Sassy private investigator Jade O’Reilly solves her own problems. She doesn’t cry when her Jeep is crudely vandalized. When news of Jade joining her ex-fiancé at a bar following her date with another man hits the small-town gossip circuit in Sweetwater, NC, she doesn’t whine to her co-workers. And when one of those co-workers suggests she trade in her combat boots for stilettos, Jade doesn’t demurely give in. She takes care of business. That business includes getting to the bottom of an investigation into a mysterious young bass player who sounds too good to be true. Will Jade be able to close the case, or will she finally have to admit defeat? This Sweetwater Short story is about 50 pages in length. Finding the person responsible for the scenes of yuletide merriment that Agnes demolishes every morning is not easy. With stealth and skill that rival Santa’s elves, the decorator strikes Agnes’s yard and eludes Jade and her surveillance equipment. Will Jade catch the decorator before Christmas morning? This Sweetwater Short story is about 50 pages in length. It also is included in the Addictive Reads: The Winter Gift Collection: 7 Uplifting Stories by Best-Selling and Award-Winning Authors boxed set. In this 20-page short story, private investigator Jade O’Reilly finds herself on security-guard duty at a supposedly haunted historic mansion on Halloween night. She doesn't believe in the rumors that say the house is cursed; she doesn't believe in ghosts. Will she by the end of her shift? This short story was originally published in the Tales from the Mist anthology.